For the most part Ironman Mallorca 70.3 was a successful race for my athletes – a few new PBs were set and the only disappointment was one DQ. Overall the coach is happy. 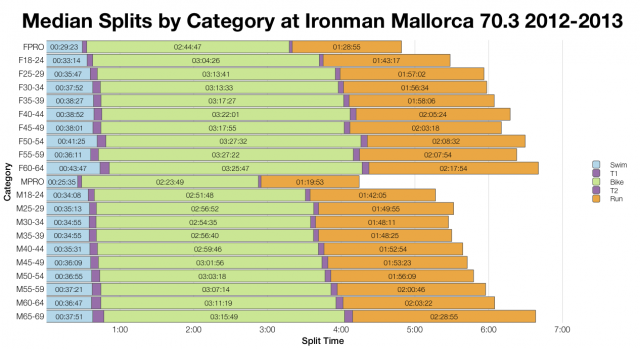 There were 3,800 other athletes also registered to race in Mallorca at the weekend, making it the biggest 70.3 event yet. As usual I’ve extracted the results for everybody who raced and looked at how this year’s event compares. 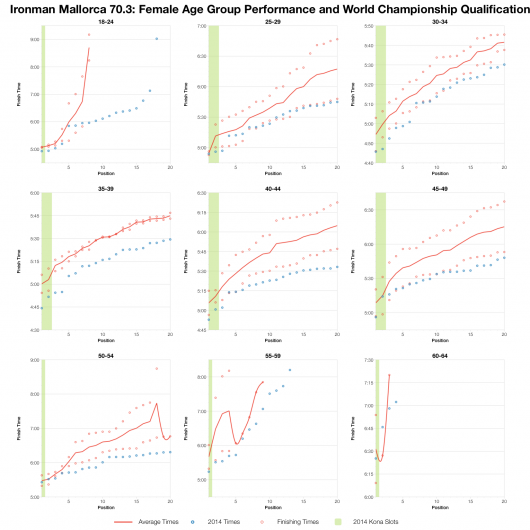 At the end of last week I looked over the results from Mallorca 70.3 in 2012 and 2013 and noted that the two years were quite different in terms of performances. Which means that combining them, as I have in the above chart, is not without its short comings. 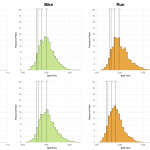 Comparing 2014’s split distributions against the previous results shows a few differences – faster swims, slower runs – but by and large 2014 sits within similar bounds. Of course the medians largely confirm the differences observed in the distributions. If we look to the pro splits it’s worth noting that the variation here is small, 2014 seems quite average. While the broad figures from the race largely suggest overall performances were comparable with past results at the front of the age group race there is a very definite trend towards faster times, often significantly so. 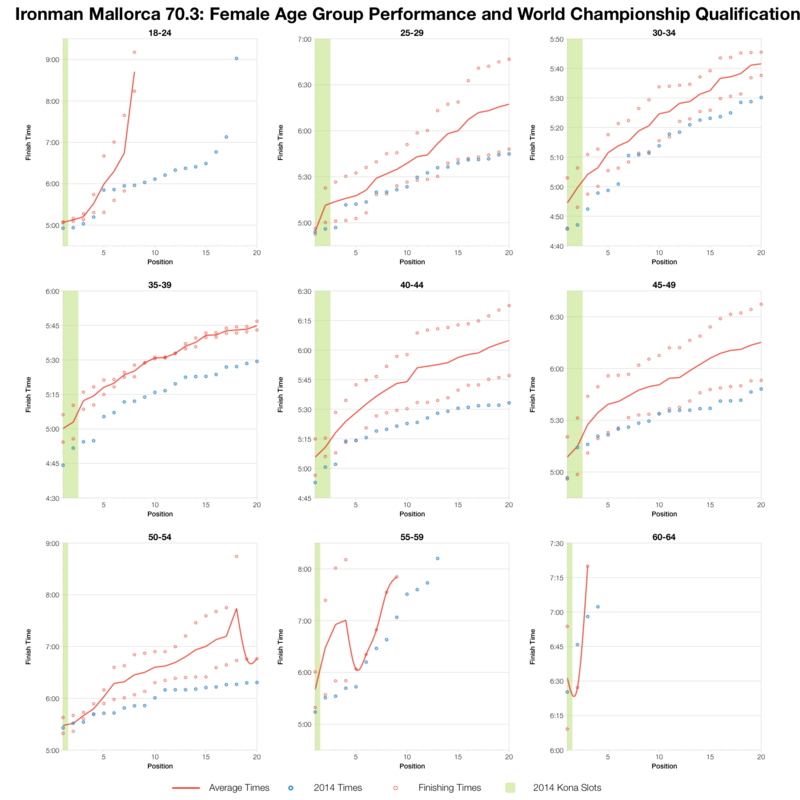 As races grow (and Mallorca 70.3 is definitely doing that) one of the interesting questions is how this impacts the competitive field. So far my impression has been that the distribution of results isn’t hugely changed – new athletes cover a spread of abilities. 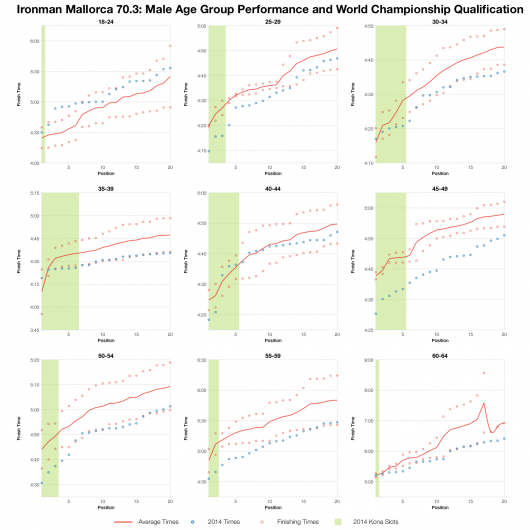 At the front of the age group race though there is a distinct impression (insufficiently tested to state with a degree of certainty) that the competition is sharpening up. In many of my recent analyses the top 20 charts buck the trends shown by the athletic field as a whole. 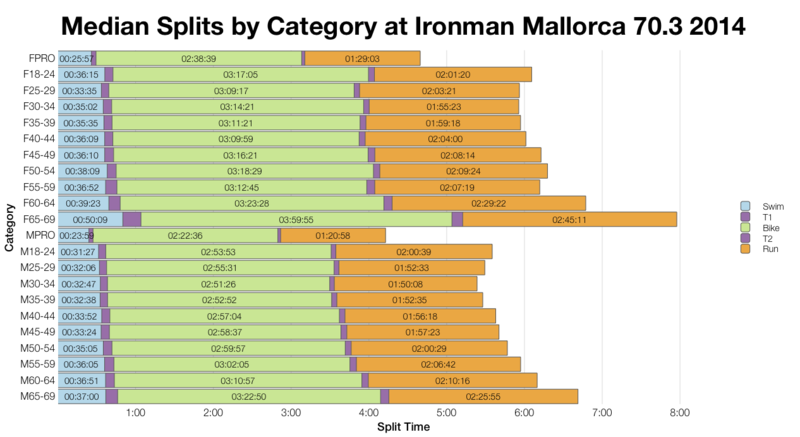 For those that want to look through the full results and splits from Ironman Mallorca 70.3 2014 I’ve uploaded a spreadsheet to my Google Drive. Now I’ll get on with reviewing my athlete’s race files and seeing what we can learn. At the very least that you should check at the Penalty Tent if you suspect you’ve been given a penalty.